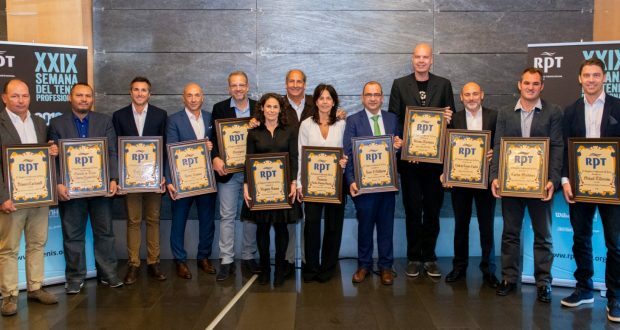 The Emilio Sanchez Vicario Foundation (FESV) has received the Best Institution 2018 award in the annual Professional Tennis Registry (RPT) awards during the 24th Professional Tennis Week, in recognition of their solidarity work through tennis. The Professional Tennis Registry, as an awards entity, is at the forefront of innovation and technical education in tennis. It pays tribute to people, entities, and institutions that, through their daily activities, are at the foundation of Spanish tennis and contribute to creating and expanding its base. Emilio Sánchez Vicario decided to start his own Foundation in 2010, with the mission of promoting personal development and social integration through sports and education. At that time, Emilio explained: “I would like to give something back to tennis and help the different social sectors in need. Through the Foundation, we can provide the possibility for disadvantaged groups can improve their way of life by using the values of sport and education”. This philosophy quickly took shape through different projects that have been growing and expanding ever since. Currently, the FESV has several schools where tennis is taught as a means of social integration, in Barcelona (Hospital Sant Joan de Déu and Academia Sánchez-Casal), Madrid (Ciudad de la Raqueta– Blind Tennis and Adaptive Paddle), Seville (Adaptive Tennis School), Toledo (National Paraplegics Hospital of Toledo) and the recently launched international tennis circuit, the Casper Tour. Ms. Marisa Sánchez-Vicario as the President of the Foundation collected the awards in recognition of the foundation’s work through its various schools and events. These events include the Forums for Solidarity, a Music Festival, the ATP Challenger Tournament, the ITF Tournament Wheelchair, and Tennis Clinics. In this year’s ceremony, the following people and institutions also received awards: Álvaro Carbonell (Best Director Award); Javier Conesa (Best Professional); Tenis Carlet (Best Club); Oliveira Tennis Pro (Best School); Pepe Aupí (RPT Partner); Ferrán Martínez (Best Professional Work); I. Gallardo (President); Eurosport (Best Communications Media); Carlos Martínez (for his work as Svetlana Kuznetsova’s coach) and Adolfo Gutiérrez (for his work as Álex de Miñaur’s coach). There was also a tribute to Virginia Ruano, for her magnificent professional career. This entry was posted in Tennis and tagged Academia de tenis, Educación, Emilio Sánchez Vicario, Fundación Emilio Sánchez Vivario, Health, Leadership, registro profesional del tenis, Sánchez-Casal Academy, Sánchez-Casal stories, solidary tennis, tenis fundaciones, tenis silla de ruedas, tenis solidario, tennis foundation, wheelchair tennis. Bookmark the permalink. What a great ceremony! Congratulations to all the winners and best of luck to your academy ! Have a wonderful Christmas and a successful year 2019!